Plasti Dip is a multi-purpose, air dry, specialty rubber coating. It can be easily applied by dipping, brushing, or spraying. Plasti Dip protective coating is ideal for a broad array of do-it-yourself projects around the home, garage, garden and elsewhere. It protects coated items against moisture, acids, abrasion, corrosion, skidding/slipping, and provides a comfortable, controlled grip. Plasti Dip remains flexible and stretchy over time, and will not crack or become brittle in extreme weather conditions. It has been tested and proven in temperatures from -34ºc to +93ºc. Plasti Dip can be dipped, brush coated and sprayed. Add more layers for greater protection and grip. Occasionally, you may need custom colours, custom formulations and technical support. Our staff is ready to help. Please click the "Contact Us" button at the top of the page and submit your questions or requests. It is recommended to prime bare metal surfaces if you wish your Plasti Dip coating to be permanent and non-removable. Primer: Clear colour. Sizes: 946 ml and 3.78 litres. 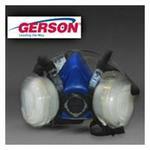 For coverage and other technical information, please refer to our Technical and Manufacturer's Safety Data Sheets. Plasti Dip is available in 429ml, 651ml and 1 litre containers and in 311 gram aerosol cans. Larger Sizes: 3.78 litre and 18.9 litre and (189 litre to order only) in standard Plasti Dip Colours or can be tinted if required. UV, Fluorescent and Glow in the Dark Formulas are also available. 651 ml. Plasti Dip Clear! This new package utilizes the same redesigned container as the Create Your Colour Kit and can be used on its own as a clear dip coating or can be tinted with our Tints-All colourants, or you can use the Create your Colour Kit. Please Note: Fluorescent colours are non-UV and will fade if out in the Sun. Pre-thinned Plasti Dip is ready for spraying. Wash surface and then wipe surface with alcohol prior to applying Plasti Dip to ensure surface is clean. DO NOT USE PREPSOL as this causes static and the Plasti Dip will have a furry finish. Stir frequently whilst spraying to stop separation of Plasti Dip and Thinners. We recommend 5-7 thin spray coats as Plasti Dip is air cured and will not dry if applied too thickly. Customers are using this product to coat their wheel rims using the Preval Cordless Spray Unit or their own spray gun. We recommend 5-7 coats of Plasti Dip to get good coverage, this will make the Plasti Dip easier to peel off if/when required. You can download the Technical Data Sheet in the toolbar below for technical information and usage instructions. Pre-thinned Plasti Dip is ready for spraying. Wipe surface with alcohol prior to applying Plasti Dip to ensure surface is clean. DO NOT USE PREPSOL. Stir frequently whilst spraying to stop separation of Plasti Dip and Thinners. 2 x 3.78 litre cans to spray the small vehicle. We cannot anticipate all conditions under which this information and our products, or the products of other manufacturers in combination with our products, may be used. We accept no responsibility for results obtained by the applications of this information on or the safety and suitability of our products, either alone or in combination with other product combination for their own purposes. Unless otherwise agreed in writing, we sell the products without warranty, and buyers and users assume all responsibility and liability for loss or damage arising from the handling and use of our products whether used alone or in combination with other products. Ever changing V.O.C. regulations in your area may require you to contact local authorities for proper use and/or disposal of this product. Should you need further assistance, please contact PLASTIC DIPs & COATINGS technical service. 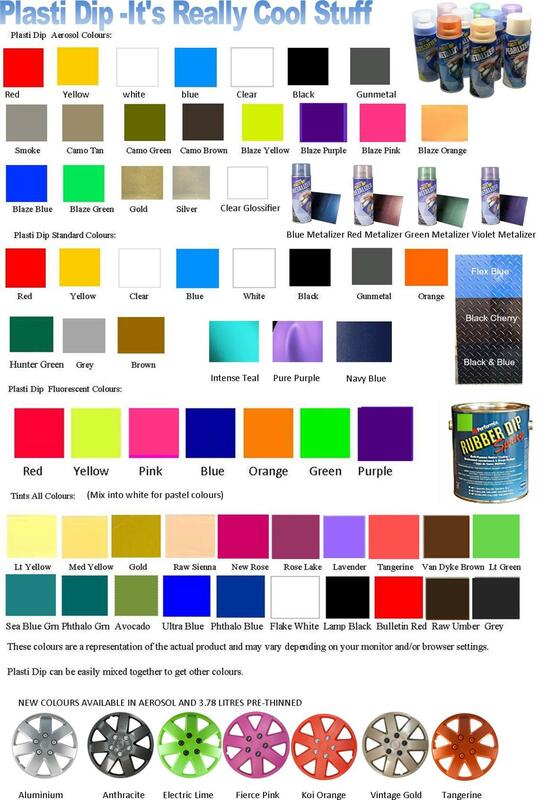 sales@plastidip.net.au or contact details on our website. Plasti Dip 1 Litre Flexible Rubber Coating 1 Litre is not available in all colours and are subject to availability.